The Kansas City Chiefs are usually competitive each season, but I wouldn't call them a marquee team in terms of ratings because, well, Kansas City isn't a huge market, for one. Second, the Chiefs generally were considered rather boring over the years because they won by running the ball and with a great defense. No star quarterback to lure non-Chiefs fans to watch. I mention this because something changed this offseason as the Chiefs are scheduled for an NFL-high six prime-time games in 2017. Monday night's AFC West matchup against the visiting Denver Broncos is the fifth. Kansas City also hosts the Chargers on Saturday, Dec. 16. And, who knows, maybe one of the Chiefs' late-season games is flexed into the Sunday night slot. Shoot, it could even be their trip to Denver to close the regular season. If you read the various "power rankings" at your sports site of choice such as Doc's, the Chiefs (5-2) probably had been on top since their shocking Week 1 win in New England (prime time game No. 1). However, they have fallen from that perch on a two-game losing streak. Now they wouldn't even be the AFC's top seed if the playoffs started today - Pittsburgh, which beat Kansas City, would be. K.C. remains a -200 favorite at BetOnline to win the AFC West for a second straight year, +400 co-second favorite (behind Patriots and with Steelers) to win the AFC and +800 to win the franchise's second Super Bowl. Denver (3-3) also enters on a two-game losing streak. Usually, when you come out of a bye week you play better because of a good week of practice and better health. However, the Broncos look nothing like the team -- mainly offensively - that entered its bye at 3-1. Denver is +350 to win the division and obviously could tie the Chiefs in the loss column and potentially make that Week 17 game a winner-take-all with a victory here. You likely know the incredible record of Andy Reid after a bye week: It's 16-2 dating to his Eagles days. That's a sign of good coaching. The Chiefs essentially are off a bye here as they last played Thursday in Week 7. That was a crushing 31-30 loss in Oakland that salvaged the Raiders' season. Bettors likely remember the Chiefs getting a backdoor cover in Week 4 on a Monday night vs. Washington thanks to a defensive touchdown on the final play of the game. Alas, Chiefs backers were on the wrong side of a bad beat vs. the Raiders, who were 3-point dogs. Kansas City was leading Oakland 30-24 and stopped the Raiders on first-and-goal at the KC 1-yard line with three seconds left but defensive holding was called. It happened again on first-and-goal at the K.C. 10 on an untimed down. On try No. 3, the Raiders scored, covered and then won with the PAT. Kansas City has become an explosive offensive team with MVP candidates in QB Alex Smith and rookie RB Kareem Hunt. Smith leads the NFL in rating (120.5) and completion percentage (72.4), is second in TD passes (15) and has yet to throw a pick. Hunt is the first rookie in NFL history to gain at least 100 scrimmage yards in each of his team's first seven games and leads the league in rushing (717 yards) and yards from scrimmage (1,002). Tight end Travis Kelce is a stud. So is receiver/return man Tyreek Hill. However, that Chiefs defense is starting to miss Pro Bowl safety Eric Berry, who went down with a season-ending injury in Week 1. That unit has been pushed around the past three weeks by the Raiders (505 yards, 32 first downs), Steelers (439 yards) and Texans (392 yards, 34 points). 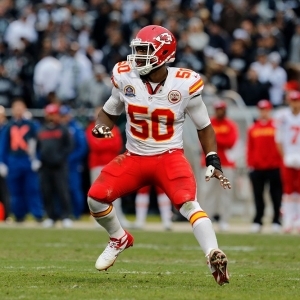 Might the Chiefs make a deal by Tuesday's trade deadline? Difference-making trades are rare in the NFL, but this looks like the best Chiefs team in years so maybe the front office goes for it. The Broncos are the exact opposite of the Chiefs right now as they are tremendous defensively but inept on offense. In the last three games, Denver's defense has yielded just four touchdowns and an average of 13.3 points per. The Broncos lead the NFL in total defense and are second vs. the rush and No. 6 against the pass. Alas, the offense has totaled just 10 points in the losing streak. The Broncos were shut out for the first time in 25 years last Sunday at the Chargers. Trevor Siemian is a nice story as a 2015 seventh-round pick out of Northwestern, but he should not be a starting quarterback. Of the Broncos' 13 trips to the red zone in the past four games, they have scored a touchdown twice. I believe this is Siemian's last chance to keep the job - he recently got a dreaded vote of confidence from first-year coach Vance Joseph. Brock Osweiler is the current backup, but the Broncos probably would turn to 2016 first-round pick Paxton Lynch once healthy. He injured his throwing shoulder in the preseason but finally returned to practice this week. At 5Dimes , Kansas City is a 7.5-point favorite (+110) with a total of 43. On the moneyline, the Chiefs are -310 and Broncos +255. On the alternate lines, K.C. is -7 (-110) and -6.5 (-130). Denver is 2-3-1 against the spread (0-2 on road) and 3-3 "over/under" (1-1 on road). Kansas City is 5-2 ATS (2-1 at home) and 5-2 O/U (2-1 at home). The Broncos are 3-7-1 ATS in their past 10 vs. the AFC West. They have covered only two of their past 10 Monday games. The Chiefs are 6-1 ATS in their previous seven after an ATS loss and last seven vs. AFC West. The under is 8-1 in Denver's past nine after a loss. The under is 19-7 in Kansas City's past 26 after allowing 30 points or more in its previous game. The road teams 6-1 ATS in the past seven meetings. Kansas City swept Denver last year. The one at Arrowhead wasn't close, while the one in Denver was maybe the regular-season game of the year and won on a Cairo Santos field goal (he's out injured right now) in the final seconds of overtime. If the Broncos don't win this, their season might be about over. They go to the Eagles next week and then host the Patriots. So that looks like 3-6 to me with a loss Monday. While I did take the desperate Raiders in Week 7 vs. the Chiefs, I can't back Siemian - especially how Denver has looked in two road games. Give the 6.5 points and go under the total.